Every beginning on a new project that is already a fully functional program is hard. There is a lot of code already written that you need to get used to and in Nomacs there is also the Qt framework that I am using for the first time. After some days of looking at the code and getting a general feel on how things work and how the code is written I started programming. As my first coding task I wanted to do something fairly simple that would introduce me to Nomacs and Qt. I decided to create a panel with a histogram of the displayed picture. 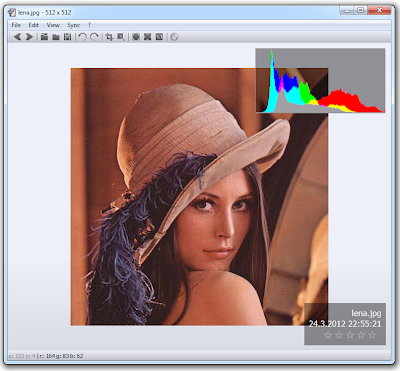 The histogram will be useful also when coding tools for image manipulation because we can compare the histogram with other programs. To create the histogram we go through each image pixel and for each channel we count the number of pixels with the same color. From the normalized calculated data we draw the histogram in a DkHistogram widget that is based on DkMetadata and DkInfoLabel widgets as it was kindly suggested by my mentors. The final result is shown in the image bellow.